Toys I handmade before I started this blog. A number shaker. I stuff a plastic bell and a 'shaker' in the cube. When you pull the ring, the cube will vibrate, thus shaking the bell at the same time. 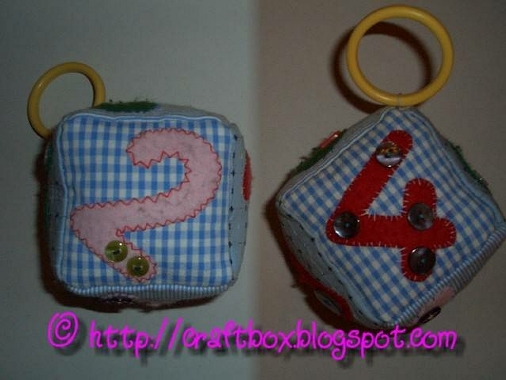 I also sew buttons according to each numbered side of the cube. A alphabet chart. I hand sew felt pockets to a large piece of cloth. On each pocket is a low case alphabet. Some alphabets have pictures the represent them. 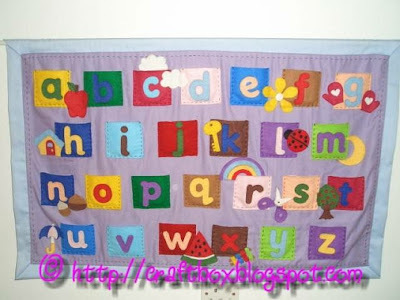 This chart is used with a set of wooden upper case alphabet set we have.